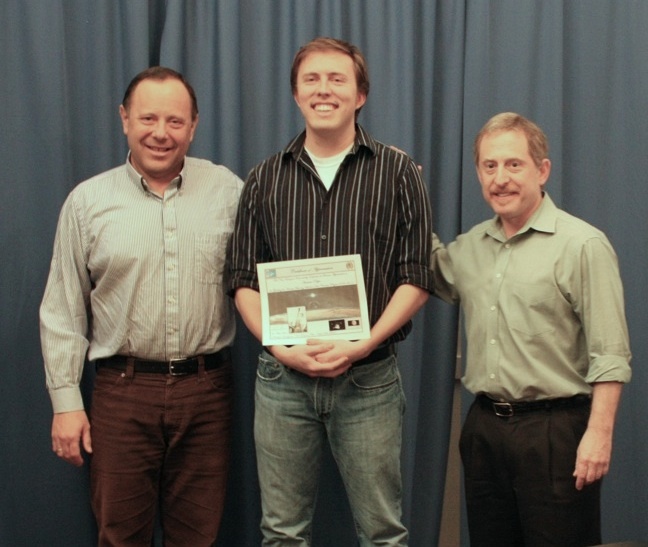 LASP graduate student Andrew Poppe has been presented with a certificate of appreciation from the NASA New Horizons mission. Poppe, who will defend his PhD thesis in Physics this spring, assisted with the mission’s Venetia Burney Student Dust Counter (SDC) instrument, which is on its way to Pluto and beyond. Poppe was presented the award by Horanyi, SDC Principal Investigator, and Dr. Alan Stern, New Horizons Principal Investigator. They recognized Poppe for his outstanding contributions to the SDC instrument operations and for his leadership of the student team.